"Deal of the year and thank god for DSW!! As I was perusing through DSW on Saturday I came across a beautiful pair of Jimmy Choo's originally marked $1100 they had a Purple Sticker that indicated they were an additional 70%off the sale price which was $599.94 which would have made them 179.99 (not bad) So I thought to myself hmmmm I will treat myself heck they are JIMMY CHOO!! Plus I had a $50.00 gift card leftover from Christmas. So I get to the register and the woman rang them and it came up as 40% off and I said...they are a purple sticker doesn't that mean 70%? She said, you are right, and on top of the 40% she rang up she put another 70% off. This made them come to $47.00 which I then used a $10.00 coupon.......FINAL COST FOR JIMMY"S $37.00..........IT WAS MY DAY!! And I still had leftover on my gift card...LOL"
Can you all believe this?! 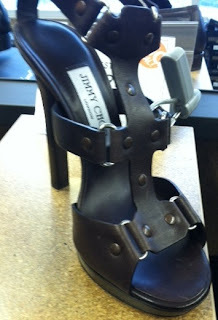 $37.00 for a pair of fabulous Jimmy Choo sandals! These will go well with a nice pair of skinny jeans or trousers ;). I invite you to share your deal of the year shopping experience, we want to know. Thank you co-worker for sharing this with us!!! Welcome to my world full of fashion, beauty, travel, style, and food. I always try to find the best bargains for everything I buy and so expect some shopping tips. I currently live in SF but have lived in Puerto Rico, Texas, Washington State, and NYC! First Time in Oahu, Hawaii! Paris in Three Days and Bordeaux in Five Days!